Fentanyl is a powerful synthetic opioid analgesic that is similar to morphine but is up to 100 times more toxic. When used legitimately, it is a schedule II prescription drug and is typically used to treat patients with severe pain or to manage pain after surgery. It is also sometimes used to treat patients with chronic pain who are physically tolerant to other opioids. In its prescription form, fentanyl is known by such names as Actiq®, Duragesic®, and Sublimaze®. Street names for fentanyl or for fentanyl-laced heroin include Apache, China Girl, China White, Dance Fever, Friend, Goodfella, Jackpot, Murder 8, TNT, and Tango and Cash. This figure shows how some nerves make opioids (endorphins) send a signal to other nerves. Narcotics (exogenous opiates) mimic this signal, turning down the activity of a nerve involved in sensing pain. Differences between Naloxone, Naltrexone: Naloxone (Narcan) is a short acting drug which will bring a patient out of an opiate overdose by stripping the opiate from the opiate receptor and is a life-saving drug. Naltrexone, a short acting opiate/alcohol blocking agent has been used for the last 30 years. All narcotics work basically the same way. Fentanyl works by binding to the body’s opioid receptors, which are found in areas of the brain that controls pain and emotion. When opioid drugs bind to these receptors, they can drive up dopamine levels in the brain’s reward areas, producing a state of euphoria and relaxation. So what’s the difference between morphine and fentanyl? The major differences relate to how the drug is handled by the body. Fentanyl attaches much more tightly to the opiate receptors than morphine, so you need much less drug to ease the same amount of pain (in fact, fentanyl is about 100 times more potent than morphine). But fentanyl doesn’t last as long in the body. A dose of morphine can kill pain for four to six hours, compared to only an hour or so for a single dose of IV fentanyl. Fentanyl is mainly produced by chemists in China. It is then shipped in bricks, or Kilos. One kilo of fentanyl when cut at a ratio of 1-part fentanyl to 100-parts filler (such as caffeine), will produce approximately 1,000,000 pills. There are estimated to be 1,400 analogs of fentanyl with only 200+ that have been synthesized and studied. It is odorless and tasteless and therefore hard to detect. In one study, the “NIK” (Narcotic Identification Kits) correctly identified fentanyl in only two out of 10 cases. An Ion Scanner, when correctly set up, will identify fentanyl and various analogs of fentanyl 99.97% of the time. One of the most dangerous things about fentanyl (or any drug or bio hazard) is cross-contamination. In the fentanyl remediation we are about to discuss, the drug producer who was living in the apartment had obviously been walking in and out of the apartment, contaminating the hallways, the elevators, etc. In this particular case, fentanyl (and carfentanyl) had been cut with caffeine and was being placed in capsules instead of pressing into pills. The amount of fentanyl powder and residue was extensive throughout the kitchen and living room as well as the bedroom where he had been using and ultimately overdosed and died. After the apartment was secured and locks changed, we received the call to assess the situation. We were immediately concerned about the traffic area between his fourth floor apartment, the foyer and entrance on the main floor. This had all been contaminated by footwear used in the apartment. We had to decontaminate the entire hallway, the elevator, both stairwells leading to the main foyer, as well as the hallways from the elevator and stairwells to foyer. This was completed by a three-step process using a commercial extractor with our bio wash solution as the encapsulating agent. The contaminated solution is contained and later discarded at the biohazard waste area designated specifically for biohazardous waste at the waste management station. Once that process was complete, we could set up our zones in the hallway and apartment: red (contaminated area), yellow (transition area), and green (decontaminated/clean area). The PPE required for such a decontamination process must be very thorough: booties, Tyvek suits, double nitrile gloved, full face respirators and wrists and ankles duct taped to prevent outside contaminants from entering. With the hazard assessment completed, now the remediation of the contaminated apartment begins. Fentanyl remediation is a process that is foreign to all restoration companies. Trauma Scene Bio Services specializes in only trauma and crime scene bio hazards, which includes drug labs, ie: fentanyl. We do not clean up fire, flood, asbestos or chemical spills. Our fentanyl remediation process has been examined and approved by Alberta Health Services. Their results stated that our process went above and beyond their expectations. As a result, they will be using our remediation process as a guideline and precedent going forward. This process was based on the actual fentanyl and carfentanyl remediation we talked about above, which was completed in a two bedroom apartment in the beginning of 2017. Our encapsulating solution that we use was tested on actual fentanyl (wet and dry) by use of an ion scanner that had been programmed for five to seven different analogs of fentanyl. After spraying the fentanyl with our encapsulating solution and wiping only once with our bio hazard wipes, the ion scanner reported a 99.997% loss of detection. The ion scanner will measure down to the nanogram. The fact that we bio wash all contaminated hard surfaces with solution three times and once with a clean rinse wipe clearly indicates the elimination of any fentanyl presence after our remediation process is complete. By following AHS and OHS regulations and implementing our own process, having it tested and exceeding all expectations and requirements, provides our company with the knowledge, understanding and the peace of mind that our job, our process has been completed to not only the best of our ability, but the best in the business. The key regarding safety and effective, proper remediation in our communities is awareness education. There are fentanyl drug labs increasing in Canada and they have been found just about anywhere: in rented homes and apartments, motel rooms, rental vehicles, abandoned buildings, barns and garden sheds. It’s likely the U.S. will be next. 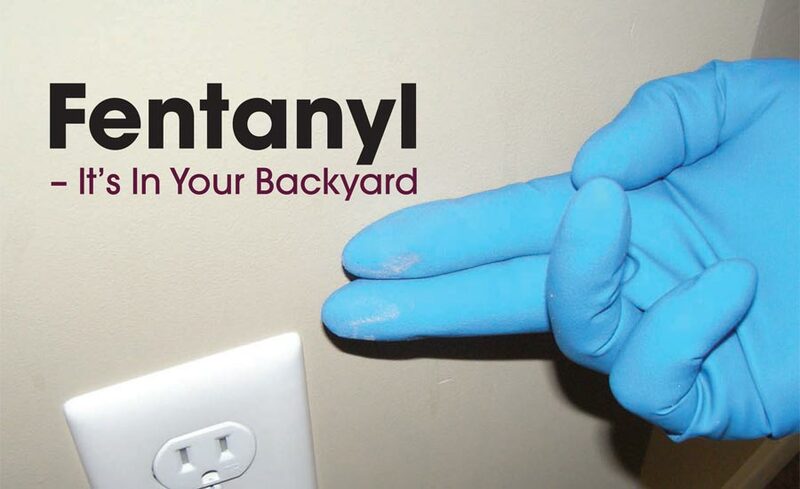 Be alert for signs of a potential fentanyl drug lab operation, including: unusual amount of white or coloured powder on walls, floors, the unusual thumping sounds that could indicate a pill press machine, chemical odours – often a strong vinegar smell, tenants reluctant to allow landlords to inspect the property, payment of rent in cash, surveillance cameras, curtains always drawn and exhaust fans running at odd times. Residents may wear filtration masks, safety glasses or other protective equipment. They may remark that they are “painting”. If you suspect that there is a clandestine fentanyl lab operation, leave the area immediately. Do not investigate, do not enter the premises, and contact your local police. -Mike Wiebe, Trauma Scene Bio Services.